Well over 200 million people died in the Twentieth Century as a result of actions undertaken by nations. What drives societies toward violent political conflicts that result in massive destruction and self-destruction? 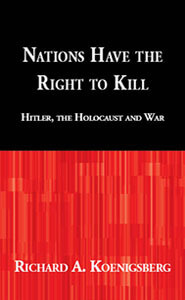 Focusing on the case of Hitler and Nazism, Nations Have the Right to Kill examines the ideas and ideologies that generate warfare and genocide. Why did Hitler believe that it was necessary to destroy the Jewish race? What was the purpose and meaning of this extraordinary project that the Nazis called “The Final Solution?” Richard Koenigsberg shows how genocide grew out of the logic of warfare. Hitler reasoned that if he had the right to sacrifice his soldiers, he also had the right to send Jews to their deaths. Once having attained power as Chancellor of Germany, Hitler—who had fought in the First World War—began planning a Second World War. He declared that if millions of Germans had to perish in the next war, he would not shrink from making this sacrifice. But then Hitler reflected: If the leader of a great nation has the right to send its “best” people to their deaths—its own soldiers—why does this leader not also have the right to send the “worst” people to die? Genocide and Warfare were two sides of the same coin: A massive sacrificial project requiring that everyone die for Germany. Richard Koenigsberg shows that Hitler waged war based on the wish for the annihilation—not only of the Jews—but of himself, his nation and the German people.